This time, we have a wholesale clearance deal on wholesale white goods for You. The offer came to us from German stock clearance wholesaler, and includes approximately 360 wholesale appliances. All of the available wholesale white goods are either Hoover or Candy graded appliances. All of the available white goods have been tested, and the result is that some of them are fully working, while the other don’t. The wholesaler did not mention the exact quantities of the working and non-working wholesale appliances in the offer, therefore You will have to ask him directly about that. This stock clearance deal consists of approximately 80% of washing machines. 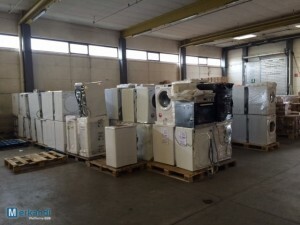 The remaining part of these wholesale white goods are dryers. The minimal amount to buy at once, is 50 wholesale appliances.